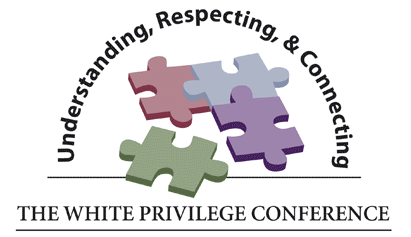 Robert Jackson-Paton has been chosen as a presenter at the upcoming White Privilege Conference, occurring March 28-31 in Albuquerque, NM. The theme of the conference is Intersectionality: Vision, Commitment, and Sustainable Partnerships. He will facilitate a workshop entitled Settlement Privilege: Unpacking the Invisible Covered Wagon. As with White privilege, invisible benefits—to Whites—accrue to White settlers through the ongoing occupation of Indigenous territories taken through a variety of dishonest means, and the transmission of that conquest through generations to the present day. The subsequent access to resources, land, wealth, education, and so on manifests as both White and settlement privilege. Environmentalism as a settler narrative will be a focus of discussion. Detailed analysis, personal narratives, as well as various interactive exercises will be provided to initiate the decolonization of White settlers in the United States, and begin conversations toward collective and individual healing. Additionally, Jackson-Paton will be leading an all-day institute – along with Saybrook Professor Jürgen Kremer and David Raymond – on the topic Facing Collective Shadows: Accounting for and Healing from White Settlement. In this experientially grounded workshop participants will begin to face, account for, and heal from the collective shadows of White settlement in the United States. Individual and group healing exercises will be initiated and reflected upon through a variety of ways of knowing, including but not limited to the arts, movement, and mindfulness-based practices. Particular attention will be given to making connections between the conquest of First Nations (Indigenous Peoples) and ongoing White and settlement privilege in order to facilitate deep self-reflection, self-exploration and collective transformation. Conversations will include decolonization strategies for Whites, the intergenerational transmission of the trauma of settlement, cultural identities connecting Whiteness and settlement, creating ceremonial protocols for collective and individual healing, as well as the possibilities of reclaiming relationships with nature, people and society. Prior to attending and presenting at the White Privilege Conference, Jackson-Paton has been selected to participate in Healing Historical Harms, February 6-7 at Eastern Mennonite University in Harrisonburg, VA. This training presents tools that assist in analyzing the legacies and aftermaths of historical trauma. The approach includes comprehensive strategies and practices for addressing historical trauma.